Since the last newsletter we have had several interesting talks and a couple of excellent viewing evenings. In 2019 the Monkton Stargazers will be celebrating the 50th anniversary of the first landing on the moon on July 16 1969 with lots of lunar events. In January we joined in the International Astronomical Union (IAU) celebration of 100 years of astronomy with a talk about the moon. A light-hearted look at how the moon influences our affairs on earth was given by John and he included two works of art by Katie Paterson – the astronomical artist who is exhibiting at the Turner Contemporary. The winter weather was not kind to astronomers but on January 28th we held an impromptu viewing evening. 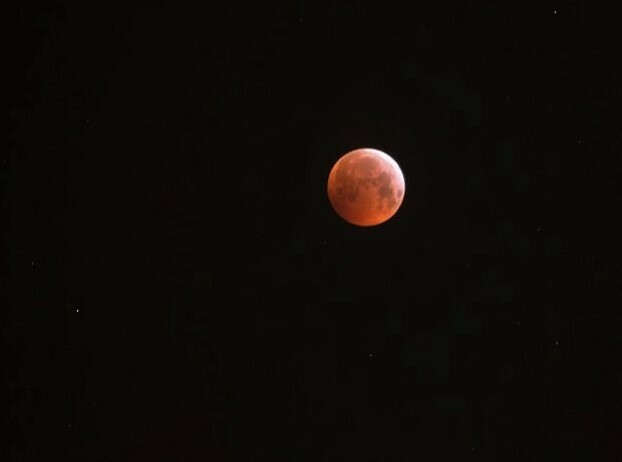 We were very lucky with the morning of the total lunar eclipse and the fabulous blood moon. It was a cold morning at 5am but it was worth it! We had teamed up with a school in Germany to take photos at the same time so that we could use the principle of parallax to determine the distance to the moon. On Friday 8th March, we had a talk by Lily Head and Cara Sullivan on ‘Famous Women in Astronomy and Space’ to coincide with International Women’s Day. Also, that evening the pupils of Northdown Primary school explained how they measured the distance to the moon, and the girls from St Joseph’s Primary school told us about their special message to the female astronauts on the ISS, Anne McClain and Christina Koch. Coming up on April 26th, Melanie King will talk about her ‘Cosmic Perspectives’ in which she uses photography to capture Ancient Light from Space.